The ideal way to keep clothes, e-devices and other valuables dry in a wet environment. 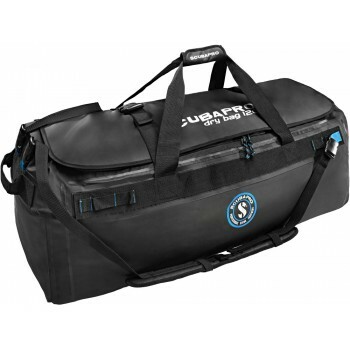 You won't find more a versatile waterproof duffel than SCUBAPRO's DRY BAG. These all-purpose gear carriers are made of super-heavy-duty PVC (Tarpaulin) fabric with taped seams for long-lasting durability. Each DRY BAG features a large main compartment that provides lots of cargo-carrying capacity. U-shaped openings with YKK double sliders guarantee easy access. On the large 120L DRY BAG a built-in plug is provided for draining and cleaning, making these waterproof gear carriers super-convenient not only during the dive trip but afterwards as well. 120L -- Dimensions: 33.5x15.8x13.8in/85x40x35cm. Weight: 5.7lbs/2600g. Volume: 31.4gal/119L.